What will my student learn in Pre-reading? The All About Reading Pre-reading program is designed for preschoolers and kindergarteners. Your student will enjoy the special games, crafts, and storytime read-alouds, and you will love the way your student effortlessly learns essential pre-reading skills. 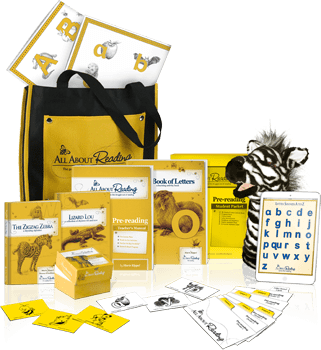 Your student will learn five very important pre-reading skills: Print Awareness, Phonological Awareness, Letter Knowledge, Listening Comprehension, and Motivation to Read. These skills lay the foundation for learning to read. Below is a sampling in each area.